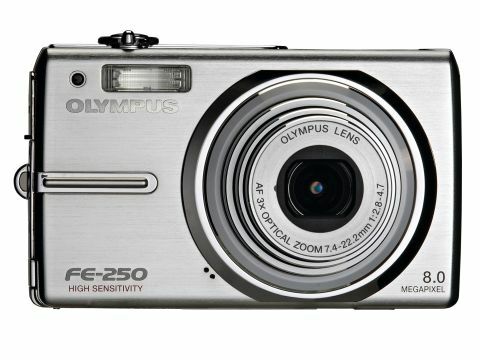 If the Olympus FE-250 had a price tag of around £120 it would be worth considering. But you can buy far better cameras for around the same price. Not many camera manufacturers would have the temerity to boast how few features their camera has, but that's exactly what Olympus has done with the new FE-250 - the top model in its FE (fun and easy) range of digital compacts. The adjustments provided with this well-built but innocuous looking little sliver of silver may be lacking, but it does have an ISO 10,000 setting. That's not a misprint, the ISO setting is a staggering ten thousand. So, at last, here's a camera that can shoot in almost total darkness. Er... not quite. You see, the FE-250 achieves its high sensitivity thanks to something called pixel binning. Okay, so Olympus calls it BrightCapture Technology in its handbook, but all it really does is chuck out most of the resolution of the 8MP CCD. It does this by cutting things right back to 3MP in order to shoot at that sensitivity. As for the results; when the FE-250 is shooting at ISO 10,000, they're terrible - blotchy, soft and compressed. Forget it. The high ISO figure may fool some gullible punters, but if you want a picture that's better than one from a cheap webcam, then don't use the ISO 10,000 setting as it will only disappoint. But it's not all bad news. The FE-250 is very easy to use and has a really superb lens. Our review model had a bit of a problem with blurring on the left-hand side at full aperture, but we're fairly sure that was a one-off fault. The majority of the shots produced by this pocket compact were exceptionally sharp, partly in thanks to the FE-250's TruePic Turbo image processor, which can produce smooth-looking photos with plenty of resolution. Now, if you're the sort of photographer who likes a degree of control over, say, metering or white balance, then this camera definitely isn't for you. There is no possibility of changing white balance presets or taking a custom reading. Metering is also fixed on the Olympus ESP Multi mode. However, if you want to be able to hand the camera over to Auntie Mavis or Uncle Bert without having to get out a flip-chart and draw a diagram for them explaining how to use it, then this is the camera for you. Manual controls are limited to flash, macro, EV adjustment and self-timer control. That's your lot. There's an idiot mode and ten scene modes. If you want any other adjustments then you're out of luck. There are a few niggling aspects to this 'fun and easy' experience. The first is that the camera never remembers your flash settings. If you prefer to shoot with the flash switched off all the time or in Red-eye mode, then you'll have to reset that choice every time you turn on the FE-250. When it comes to focusing, the camera is hesitant and spends time hunting for something to lock on to. The sluggish shutter lag can really get on your nerves after a bit, too - you really wouldn't want to take this camera to Brands Hatch for a day's motor racing. Another infuriating habit of the FE-250 is that its flash goes off, even in broad daylight. This drains the battery fairly quickly and means you don't have many shots to play with on a single charge of the wafer-thin Lithium-ion battery. In terms of image quality, the colours produced are a little on the warm side and perhaps a trifle insipid at times. Olympus normally does a fairly good job with colour reproduction but the yellow cast and lack of bite in the shots does leave you wishing for a bit more saturation. On a more positive note, the amount of detail that the camera can resolve is very good indeed. This is thanks to a 1/1.8-inch sensor coupled with a really good lens. Olympus has always built its reputation on optics and this camera keeps up that tradition. It's only a hair's breadth under 3x, but it certainly performs well enough. However, a good lens is not enough to make up for other shortcomings. Remember, this camera has no mechanical image stabilisation or other gizmos that other makers offer.